Equipped with an iConverter management module or Network Interface Device (NID), the 2-Module Chassis provides a secure local or remote managed solution capable of supporting advanced Ethernet services for Enterprise and Service Provider networks. It can be remotely managed via IP-based SNMP or Telnet. In Enterprise networks, the 2-Module Chassis is ideal for extending a fibre network connection across a campus or to add a node to an existing fibre ring. The 2-Module Chassis provides a carrier-grade solution; combining a compact edge switch with a managed media converter. In Service Provider networks, installing an iConverter NID plugin module and a four-port switch module provides a securely managed Carrier Ethernet demarcation for one or more User to- Network Interfaces (UNI). This configuration provides an MEF certified deployment supporting advanced Operation, Administration and Maintenance (OAM) features. The iConverter 2-Module Chassis can be wall-mounted using the optional wall mounting kit or installed on a stable, flat surface. Utilizing the iConverter 19” rack-mount shelf, two chassis can be securely mounted side-by-side. Fixed parameters that can be monitored include chassis configuration, power supply health status and network traffic statistics for the modules. In addition to all standard iConverter SNMP traps such as module insertion and removal, 2-Module Chassis models 8230-1, 8231-1, 8232-1, 8235-1, 8236-1 and 8238-1 support Dying Gasp traps (Power Loss Traps) in the event of loss of power. All of these events can be selectively enabled or disabled to generate SNMP traps. In this Enterprise application, media converter modules are installed in a managed iConverter 19-Module Chassis for high-density fibre distribution from UTP switch equipment. 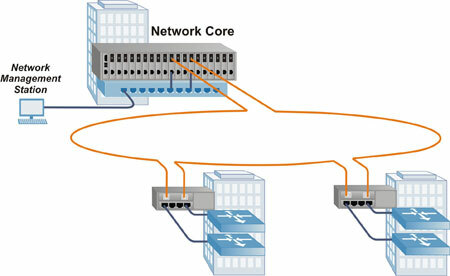 A fibre ring connects both buildings to the Network Core. At each building, a fibre-to-fibre module is installed in a 2-Module chassis with a four-port switch module. The two modules share data via the chassis Ethernet Backplane. This configuration functions as a remotely managed departmental switch with a fibre ring to the Network Core and four 10/100 or 10/100/1000 ports. The 2-Module chassis can also be deployed in a point-to-point application as illustrated in the Service Provider application. In this Service Provider application, media converter modules are installed in a managed iConverter 19-Module Chassis for high-density fibre distribution from UTP switch equipment. At the Customer Premises, an iConverter NID module and a four-port switch module are installed in a 2-Module Chassis. A fibre link between the Central Office and the Customer Premise provides a securely managed demarcation solution supporting advanced OAM fault detection and performance monitoring.